North Saskatchewan Riverkeeper welcomes new manager of Water Literacy! 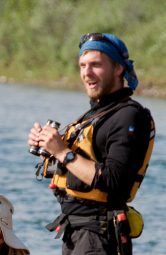 The North Saskatchewan Riverkeeper, in partnership with Swim Drink Fish Canada, is pleased to announce the debut of our new manager of Water Literacy, Hans Asfeldt! Hans brings to the role a wealth of experience and leadership on key environmental issues in the Prairie region. With a background in environmental science and political science at the University of Alberta, Hans is ideally positioned to coordinate a diverse range of programs that have evolved since our founding in 2009 and has already made great strides on our new initiatives since stepping into the office on June 1st. Over the past five years, Hans devoted himself to the development of an inter-disciplinary research initiative at the U of A’s Chester Ronning Centre that investigated the complex challenges of Alberta’s oil and gas economy. As part of his work on energy development in communities across the province, Hans acquired valuable experience as a field researcher and refined a strong set of project management skills that have helped him champion a number of innovative research and engagement projects. Most recently, Hans piloted a community-based research program at the University of Alberta and the University of Calgary that empowered undergraduate students to enhance their classroom learning by directly engaging with knowledge leaders and stakeholders from the field around challenging energy and environment issues. Hans has also produced a series of documentary films about the relationships between land, water, energy, and communities. With roots in Athabasca and an education earned in Camrose, Hans has always maintained close ties with the creeks and rivers in his backyard. As a professional wilderness canoe guide, Hans is well acquainted with the North Saskatchewan River right from its headwaters. Over the past two years from his home in Edmonton, Hans has also come to love running in the Whitemud Creek Ravine. During his university years, Hans trained as a competitive cross-country runner and skier and together with his paddling ambitions, Hans is an avid outdoors enthusiast. Hans’ appreciation for the diverse urban and rural landscapes of the North Saskatchewan River Basin provides a basis for his view that by working together, we can reclaim and protect pristine waters for generations to come. Hans will be out on the river regularly to monitor water quality and he will be engaging the community frequently through our education and advocacy programs as well as through our website, Facebook and Twitter. If you would like to reach Hans directly, please contact him here. Congratulations, Hans, and welcome to the team.